Long-time readers of the site will know that last year, we changed the name of our weekly “best Raven” award to “Play Like a Ray Rice,” after a string of having to give the honor to #27 week after week after week. He started 2010 off slowly, but Rice looked like his old self again on Sunday, racking up 150+ total yards and two touchdowns. If it were up to us, he’d also be the team’s default goalline back moving forward, as he fared much better in such situations against Denver than either Willis McGahee or Le’Ron McClain. Anyway, it was fairly obvious that Rice was the best player on the field Sunday. It’s not uncommon for that to occur, so we’ll just name the award after Rice again, and move on to honoring another guy who had a great afternoon. After teetering on the edge of being the “Did Not Play Like a Raven” in Pittsburgh the previous week, Fabe bounced back with a vengeance against the Broncos. It would still be nice if the guy could catch even a little bit, but Washington batted down four Kyle Orton passes when it seemed like ol’ Neckbeard was trying to pick on him. I’ll give him a pass for the dropped picks though, as Fabe has never been an interception guy (his career high is 4, with Oakland in 2006, the only time in his career he had more than one in a season; he hasn’t picked off a pass since week 12 of 2008 against Philadelphia.) 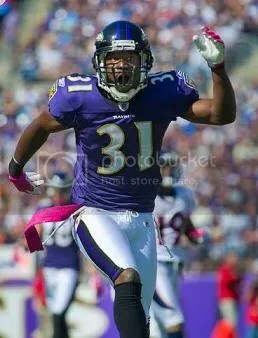 Still, this was the player the Oakland Raiders thought they were getting when they used the 23rd overall pick on Washington in the 2005 NFL Draft – a quick cover corner with the ability to shadow guys all over the field and break up passes when given the opportunity. Fabe looks to be fully recovered from his ACL injury and to be rounding into top form as the season approaches it’s midway point. If he keeps getting his hands on a few passes a game, an interception or two is sure to materialize. In the meantime, it’s great to see #31 making plays on the back end. Maybe try it with helmets next time, fellas? 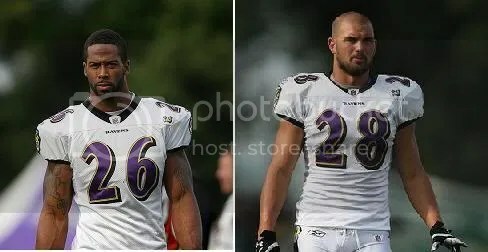 Both starting safeties for the Ravens are going to catch my ire here this week. Dawan Landry and Tom Zbikowski were each directly responsible for one of the two Denver touchdowns on Sunday. It’s been a fairly disappointing season for Landry as a whole. While not terrible, he hasn’t done much to separate himself from “random disposable safety” either. In training camp this year, he earned the nickname “Whop” from his teammates, as it seemed like a hard hit from #26 was putting a new Raven out of practice every other day. So far though, I can’t think of any instance where Landry has come up and laid wood on an opposing ball carrier to the point that I even noticed, let alone was compelled to stand and cheer. Apparently the guy saves his hardest hits for his teammates. And now he’s getting burnt in coverage too? Super. Not to be outdone though, fellow safety Tom Zbikowski would be picked on for Lloyd’s second touchdown, a 44-yarder in “junk time” of the game. While cornerback Josh Wilson was also responsible for Lloyd on the play, Zibby was playing over the top and failed miserably to give Wilson the help that he obviously required. This was a play that never happens with Ed Reed on the field. The same can’t be said for the first touchdown, as Landry was the safety on that side of the field. Still, getting Reed back in the lineup will go a long way towards stopping these kind of deep strikes. It would be great if the schedule had worked out to where the Ravens were playing the Buffalo Bills at home this week, and at New England in week 7, when Reed is available…but dem’s da breaks. Even without Randy Moss, Tom Brady will be ecstatic to not have to account for Reed every time he drops back to pass. Mike Preston today suggested that the Ravens give Haruki Nakamura another look at safety in passing situations, with Landry and Zibby both struggling to varying degrees. As always, I agree with Mike Preston. This entry was posted on October 12, 2010 at 11:56 am and is filed under Ravens, Ravens Game Recaps. You can follow any responses to this entry through the RSS 2.0 feed. You can skip to the end and leave a response. Pinging is currently not allowed.